Cleft and lip palates is a common worldwide birth defect, where an infant is born with an opening on the upper lip, roof of the mouth, or both. This defect can cause speech impediment and difficulty eating. Here at LOS ANGELES ORAL SURGEONS, we are proud to say that we have professionals who specialize in correcting this defect. The cleft and lip palate Los Angeles procedure are very minor and affordable to any of our clients. A lip cleft or palate is usually repaired through a simple surgical procedure. The procedure involves anesthesia for a less painful experience for our patients. Surgeons connect the lip or palate muscles and then rearrange the tissues which are in order to close the cleft. There are two types of clefts: unilateral cleft and bilateral clefts. A unilateral cleft is one where the patient’s lip or palate has an opening on one side. Whereas the bilateral has openings on both sides of the mouth. This dictates which procedure to be undertaken on the patient. A special procedure is performed on patients with bilateral clefts. Lip adhesion or a molding plate may be used to help bring the lips together before they are fully repaired. As one continues to grow, his or her facial structures tend to change. Follow-ups after surgery are scheduled in order to help our patients adapt to their growing bodies. Supplementary surgeries like pharyngoplasty, help improve speech and provide stability of permanent teeth. Infant patients require a maximum of 12 procedures is required for a patient to obtain a 96% percentage of positive results. Adults require a maximum of 3 procedures. These procedures usually leave a small scar on the lip. As patients mature they may want to remove or lighten the scar to make it less visible. The Los Angeles oral surgeons offer these services at a pocket-friendly price. Most patients take about a week or two to bounce back to their usual behavior after surgery. Complete healing of the wound takes about 3-4 weeks. 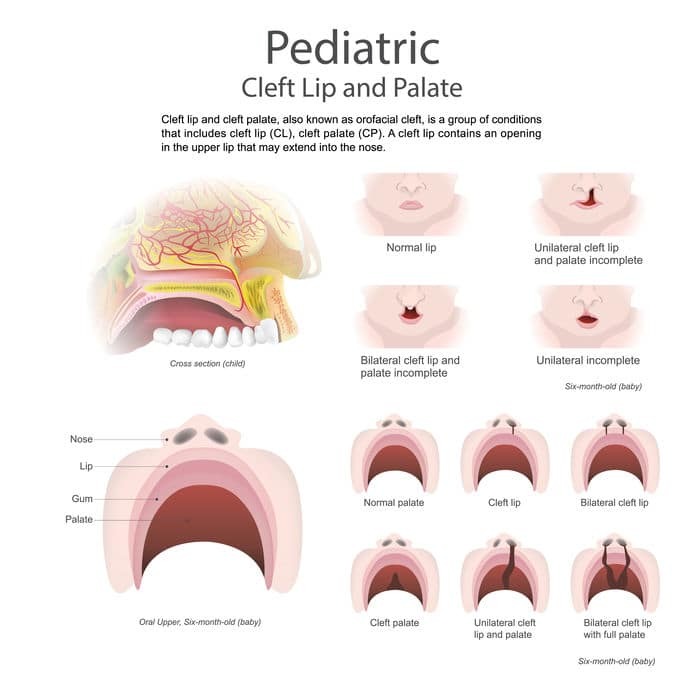 For children, they may be required to wear padded arm restraints, which are also available with the cleft lip and palate Los Angeles procedure to avoid children from rubbing the surgery area. During recovery, the patient is required to eat soft foods and avoid any crunchy substances like cookies, crackers, or chips. Children however can continue to be fed with the same bottle system used before the procedure. Our surgeons are confident welcoming you to our services which you are ensured to be above standards. Stop by today for you cleft and lip palate Los Angeles treatment and give yourself that charming smile.